Camping and outdoor life are fun and enjoyable. The whole experience gets a massive boost if you have a reliable portable generator to power your various gadgets and electronics. To help you in your search, we have compiled only the top models in the market. Showing you the best RV generator suitable for your vehicle, and the best generator for camping to power your next trip. With our comparison tables and unbiased camping and RV generator reviews, you should be able to make a more educated choice towards choosing the right portable generator for your needs. Whether it’s at the camping site or in your recreational vehicle, we’ve got it all covered with a simple list of top generators most suitable for camping and RV life. In addition to our multiple comparing tables, we will also teach you how to set up the generators and how to maintain them for a great outdoor experience. Tank Run-Time @ 25% Load: 8.6 hrs. Fuel Type: Gas+Propane Capacity: 1.6 gal. Noise Level @ 25% Load: 59 dB. Tank Run-Time @ 25% Load: 10.75 hrs. Fuel Type: Gas Capacity: 0.8 gal. Fuel Type: Gas Capacity: 1.5 gal. Yamaha generators boast the longest engine durability ratings that can be issued by the Environmental Protection Agency. The Yamaha EF2400iSHC is very durable. Its low oil warning system helps prevent engine damage, caused by low oil. The electricity this generator produces is comparable to what your utility company offers. As such, it can safely be used with sensitive electronic devices, such as smartphones, and tablets. Alternately, with 2400 watts starting power, and 2000 watts running power, this inverter generator can also be used with high-wattage devices, such as most energy-efficient air conditioners. This machine can run an RV air conditioner in temperatures up to 110F and will run most RV conditioners rated at or below 13,500 BTU, as well as microwaves, heaters, etc. The Yamaha EF2400iSHC throttle feature results in a much quieter generator that operate at maximum fuel efficiency, with 53 decibels of noise at 25% load, and 60 decibels at full load. It has 1.6 gallon gas tank that runs for minimum 8 hours at 25% load. And with the fuel gauge on this machine, you can see the current gas level at a glance. It’s also CARB compliant, making it an ideal choice for RVs, and outdoor life. Has a throttle feature that automatically adjusts the engine speed to match the output load; allowing you to only use as much power as you need. Equipped with multiple power outlets, this machine is packed with durable heavy-duty power, while maintaining user-friendliness. Weighs 75 pounds and lacks wheels which makes it hard to move and carry. Maintaining oil changes is not an easy task. The Champion Power Equipment 100263 makes a great choice for camp, boat, and RV. Its dual-fuel option with its easy selector switch means that it can run on gas and propane, which may come in handy. Rated at maximum 3400 starting watts and 3100 running watts. This inverter generator can power a variety of appliances, enough power to run a 15,000 BTU air-conditioner. Produces clean and stable energy safe to use with delicate devices and electronics such as digital cameras, smartphones, and laptops. This dual fuel generator can run over 7 hours on its 1.6 gallon gas tank, and up to 14 hours on a 20lb tank of propane, at quarter load. Produces just 59 decibels of noise when in a quarter load operation, it’s quiet and fuel-efficient. CARB compliant and full of great features, such as; electric start button, low-oil shutdown, easy access panel with RV-ready TT-30 plug, two household outlets, and USB. It’s also parallel capable allowing you to double your power by connecting it to another unit. It’s a useful addition to your RV or camping site that adequately meets your power needs and requirements. It has an economy mode to save fuel by arranging it’s speed according to the power being used. RV ready with easy access control panel allows you to take control of the whole machine. It’s a heavy machine, weighing 97 pounds. You have to tilt the generator at a low angle in order to use the wheels. The Generac GP2200i is all power and no frills. 2200 starting watts and 1600 running watts, this camping generator can cover most of your power needs. The 1.2 gallon fuel tank allows for over 7 hours of run time at 50% load and over 10 hours at 25% load. With an economy mode that allows the engine to adjust its speed to match the electrical output; providing excellent fuel economy and noise reduction. A cost-effective solution for recreational use, the GP2200i is the perfect size for tailgating, camping, and power on the go. Easy to start with a built-in handle makes it easy to transport. Weighs a bit over 46 pounds with a compact enclosed design. Produces clean, stable power ideal for sensitive electronics, tools, and appliances. It’s also parallel capable, easily connect two of these through a parallel kit for double the power. The Generac GP2200i may not have all the bells and whistles many generator companies are incorporating into their newer models. That doesn’t mean that it’s any less reliable; it just means that this machine is designed for one thing and one thing only, to produce power. Has an integrated OFF/ON/CHOKE knob that simplifies startup procedures. Incorporated LED indicators for alerting the user when the unit is ready to use, overloaded, or low on oil. Does not have a fuel gauge for monitoring the fuel level. Some users found it hard to run the engine, it takes more than one pull to start. Looking for a small generator? The Westinghouse iGen1200 provides a variety of premium features at a great value. 1200 starting watts and 1000 running watts, it’s a great option for working on small projects around the house, tailgating, or while camping. The iGen1200 weighs 33 pounds and has a built-in carry handle for easy transportation. Utilizing asymmetrical cooling fans, low tone mufflers, and a double-insulated acoustic enclosure to reduce the generator’s operating noise. Makes only 52 decibels when running at 25% load. Has two USB ports and 120V household duplex outlets. Safely get high-quality electricity for all of your sensitive electronic devices. The iGen1200 is also parallel capable. So you can just plug it and connect it through a parallel cord to any Westinghouse iGen series inverter generator to upgrade your power. Not to mention it’s overload protected and equipped with low oil shut down feature that protects the engine in case the generator runs low on oil. It’s also CARB compliant. So, it’s ready for you to to take it on your next fishing or hunting adventure. Compact, lightweight with an easy to use control panel and warning lights. Features an enhanced fuel efficiency. With less than one gallon of gas tank runs up to 9 hours at 25% load. Not suitable for heavy-duty power equipment. Lacks an electric start option. 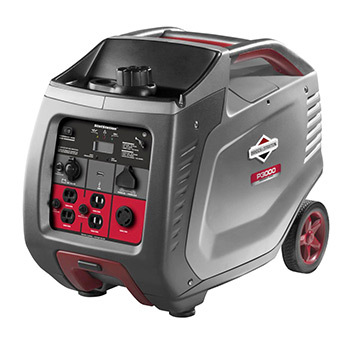 The Briggs & Stratton 30545 P3000 Powersmart is designed with on the go power needs in mind. A luggage-style retractable handle, a built-in two-person carry handle, making it easy for two people to lift this machine. Equipped, with two 6 inch wheels designed to never go flat, even across rough terrain. With a starting output of 3000 watts, and a running output of 2600 watts, enough power to run an average air conditioner. At 25% load and with only 1.5 gallons of gas the P3000 runs up to 10 hours. Boasting an especially user-friendly feature; this generator has an LCD display; allowing you to check the amount of energy used, and the total amount of running hours left of the unit. Not to mention maintenance reminders, such as oil, and filter. Being able to see the entire status of your power machine is a sought after convenience not standard with most generators. With less than 3% total harmonic distortion, this inverter generator is safe to use with sensitive electronic devices. The P3000 PowerSmart Series is a good option for RV camping, tailgating, and can provide for emergency home backup power. Fuel efficient with an auto idle control feature. With a convenient and easy to use control panel. Parallel ready, allowing you to maximize your power by connecting it with another P3000 or a P2200 PowerSmart series. Weak sound insulation in the casing which may make it sound louder than rated. Draining the oil is not an easy task without splashing out. 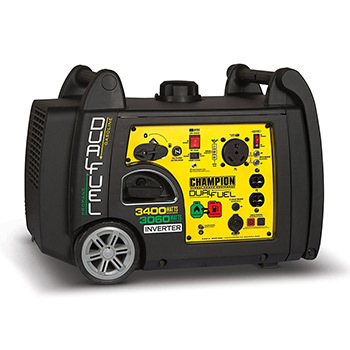 Designed with safety and convenience in mind, the Champion Power Equipment 3500 watt portable generator is a great option. And, just as its name suggests it’s also RV ready, with 4000 starting watts and 3500 continuous watts. Powerful enough to run high-power appliances and devices that you may have in your RV such as fridge, microwave, and the entire automobile’s lighting system. Has a powerful engine protected by a rugged steel frame that adds durability to the whole unit. With a large gas tank of 3.8 gallons that allows for a runtime of over twelve hours at 50% load. Powerful enough power to start and run a 15,000 BTU RV air conditioner. Featuring low oil shut-off sensors, circuit breakers, along with multiple power outlets. In addition, Champion’s built-in surge protector Volt Guard that keeps your connected appliances safe from any voltage fluctuation. 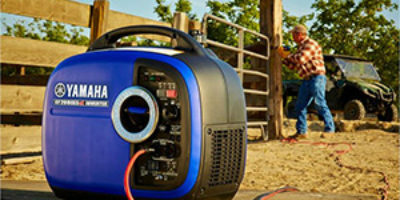 Overall, a rugged generator that you can easily connect to the back of your trailer and hit the road. An Intelligauge for monitoring voltage, frequency, and running hours for easy tracking for your power output and maintenance schedule. Champion’s Cold Start Technology that ensures your generator will run in cold weather. As loud as a vacuum cleaner, has 68 decibels during operation. Weighs 97 pounds, heavy for being called portable. However, wheels kit is available if you want it more transportable. Engine Displacement (cc): 171 cc. 192 cc. 80 cc. 54 cc. 171 cc. 196 cc. A good camping generator should work well with the different electronics and appliances that you have. Sensitive electronic devices such as smartphones or DSLR cameras can be damaged by unstable power sources. These sine wave inverter generators produce safe and clean power just like your wall electricity at home. This makes picking an inverter type generator over a conventional one a safer choice if you will be mainly charging delicate electronics. Type of fuel used to run your generator may be an important factor to keep in mind. Depending on where you are intending to use the generator, and which fuel type will be easier to obtain. 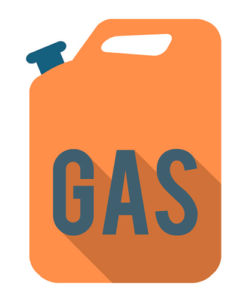 Gas-Powered: Gasoline is more budget-friendly, it’s relatively cheaper than other fuel types. Readily available, and easy to use. Propane-Powered: Propane has an indefinite shelf life unlike other types of fuel. Propane generators run quietly as well when compared to other types of generators. Diesel-Powered: Diesel generators are popular for their fuel efficiency. They are easy to operate and maintain. Dual-Fuel: Such generators run on both propane and gas. Their dual fuel capacity makes them convenient in case you run out of either of the fuel types. Solar-Powered: Solar generators produce power from the free energy of the sun, they work in silence, and are eco-friendly, with no emissions. They are great for safely powering low-wattage devices. Your power needs are influenced primarily by the appliances and electronics that you intend to power up. For a small camping trip, a generator rated at 1000W is perfect for powering small devices such as your smartphone, lights and small tools. To fully power up your motor-home, you need a generator rated at 3000W or more to comfortably run heavy-duty appliances such as that 15,000 BTU rated air conditioner in your RV, fridge, electric grill or other tools. More is usually better as you will be able to meet any extra power requirements and adjustments. Generators are measured in decibel according to the noise level they produce. Manufacturers are taking this noise issue very seriously with most of them adapting to creative ways to ensure that their engines are as quiet as possible such as Honda’s two-tiered noise dampening system. Generators rated 60 decibels or less are the best in this regard. At this noise level, you can comfortably have a conversation and be less of a distraction to your neighboring campers. It should be noted that as the power rating of a generator increases, its noise level is bound to increase as well. If you want more power you should, therefore, expect a little bit more noise. Your power source should be portable enough to make your travels easier. Portable generators are usually not heavy or bulky, and they can easily be moved around by one person. Portable generators should have wheels and adjustable handles for convenient handling and movement. The portability and power rating of a generator usually go hand in hand. In an attempt to generate more power, highly rated generators incorporate a lot of parts and this makes them bulky. Moving such generators, therefore, becomes difficult. To solve the issue of portability and power, you can choose to connect two smaller generators for double the power. This way you can easily move the generators from place to place and effectively meet your power requirements. Fuel efficiency is another aspect that you have to look out for. The top camping generators, in this case, are those that are able to adjust their engine speed according to the applied load. When you only have light appliances connected, the engine automatically lowers the speed and this results in minimum fuel consumption. The engine should only be engaged in a full-throttle mode only when it is necessary. 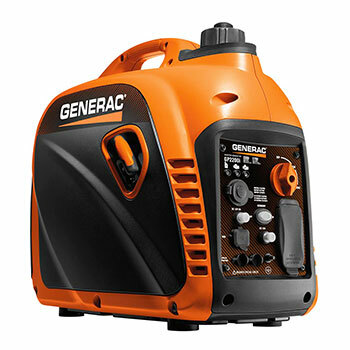 Features for an easy to operate, and easy to use generator. It covers automation and generator monitoring. The low-oil shutdown is one such feature, that prevents engine damage in case it runs low on oil. A visible fuel gauge for monitoring the level of oil or gas is another feature. LCD display or a volt-meter are other great user-friendly features. A wireless remote start may also be an extra feature that is useful for some situations, giving you the option to start and stop your generator from far. When not in use, store your generator in a cool and dry place away from falling hazards. 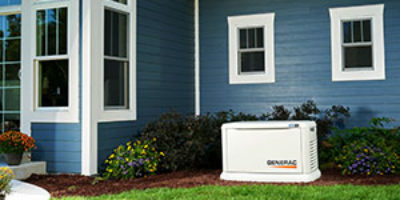 The area you choose to store your generator should be free of moisture and any form of water. Ensure that the generator is covered up to keep away dirt, dust, mud, and grime. Servicing your generator regularly is very important. Modern generators are efficient machines that can run for long periods without breaking down. However, if you are to make the most of your generator and use it for a very long time, then you should have it serviced regularly. Take it to the nearest repair shop for service and checkup. The service attendants will be able to notice any deficiencies and initiate the necessary remedial measures. In a year, you should service your generator every 4 months. Keep a record book of this services for timely assistance and repairs. Stale fuel is not good for your machine. It causes start-up problems to your generator and if the issue is not rectified immediately, it could result in generator breakdown. Most manufacturers would recommend adding a fuel stabilizer into the oil before storage, but, there is no guarantee that this option would eliminate the startup problems. We would recommend draining the stale oil and using fresh fuel to run your generator after a long period of inactivity. If you don’t intend to use your generator for a while, then you should make an effort to exercise it regularly. Regular exercises keep the generator parts lubricated, prevents the oxidation of the electrical contacts and uses up any unused fuel before it gets stale. It also eliminates generator startup problems since the engine is always active. Exercise your engine at least once every month for almost one hour. Make sure that the generator is loaded up to a third of its power capacity. That way it will always be ready for any vacation or camping trip that shows up. 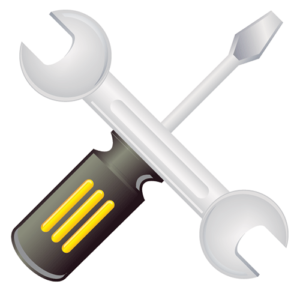 Use a dipstick to check the level of engine oil in the generator at regular intervals. You should make sure that the level of oil is as close to the full mark as possible. 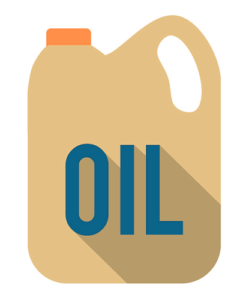 When adding or replacing the oil, use the manufacturer’s recommended brand. The oil and its filter have to be changed at certain intervals. Stick to the pre-determined intervals for the best operation. As you drain the oil and replace the filter, do so in an environmentally conscious manner to avoid damage or liability. Always make sure that the batteries are clean. If you notice any dirt pile up, wipe it off using a damp cloth. If there is corrosion at the terminals, remove the cables and clean the terminals with a baking soda solution. As you do this, you should be careful to ensure that the solution does not enter into the battery cells. Then rinse with a damp cloth, replace the connections, and lightly apply petroleum jelly on the terminals to coat them. Seamless power delivery to the recreational vehicle. 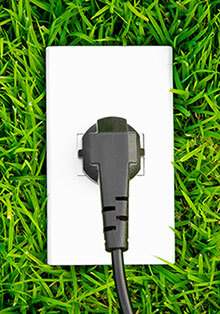 Eliminates instances of electrical hazards that are as a result of poor connection and cabling. The place you choose to mount your generator should be firm and sturdy to support the generator. The site should be a stable level to ensure that the generator does not fall over in operation. However, if there is a built-in generator tray on your RV, set the generator on this tray. If your RV doesn’t have a built-in generator tray and you wouldn’t wish to set up your generator on the ground, you can choose to build a generator tray. Just find several panels and screws and build a generator tray, then use straps, brackets, and clamps to secure the generator to it. You then have to fuel the generator. Some RVs can share the vehicle’s fuel with the generator while others don’t. If yours doesn’t, simply fill up the tank with fuel. Firmly secure the tank after filling it up with fuel to ensure that there are no leakages. Always fill up the generator with the specific type of fuel that it runs on. Connecting a battery right next to the generator and secure it tightly with a clamp. Connect the battery’s positive and negative terminals to the corresponding generator terminals. Cover the terminals to minimize damage by sparks. Fumes from the generator may end up in your RV or that of other campers around if it isn’t directed properly. Make sure that the generator’s exhaust is facing away from the RV camper and other people to avoid carbon monoxide poisoning which can be fatal and life-threatening. Learn more about some of the most essential items for dry camping here. Well maybe finding the best generator for camping or the best generator for RV is no easy task. However, we believe that our comprehensive guide and individual camping generator reviews will make this process a whole lot easier. In our camping & RV generator reviews, we got to show only the best RV generator models from different companies and brands. With the options we have presented, it should effectively meet all your power requirements. Whether you are camping, tailgating or spending time in your caravan or boat, with all these information, you are now well placed to make the best decision regarding the generator that you should acquire. If you have any question or comments, feel free to get in touch with us via the comment section below.